World 6-2 is the second level of World 6 of Super Mario 3D Land. The course is set in a pyramid. This is the only pyramid level in the game and features Pokeys and Blokkabloks as main enemies. Mario starts in a ground full of spikes, as well as four coins and one Pokey, who sprouts from the sand. The second room contains more spikes, a Pokey and a Blokkablok. Entering by an elevator, Mario reaches a room which the floor is made entirely of raising and lowering platforms with Pokeys on them. By finding the right platform, the player can enter a corridor, where the Checkpoint Flag is located. This area also contains spikes, a Blokkablok and two elevators. The next room contains two Blokkablocks and a pit with spiked platforms being the only way to cross it. A Red Ring is found in this area. To the very right of this room, there is a Warp Pipe that leads to the exterior of the pyramid. This last area has a Flying ? Block and raising platforms, that can be useful to reach the Goal Pole. Star Medal 1: In the second room, this Star Medal is found by entering a door at the right side of the wall, being hidden by a Pokey. The player can also reach it by walking behind the wall before entering the room. Star Medal 2: Above the platforms room, the player must roll and break a Brick Block in the wall, opening a way to the second Star Medal. Star Medal 3: In the vertical corridor with two elevators, the player must jump from the second elevator to a very narrow incline in the left side. 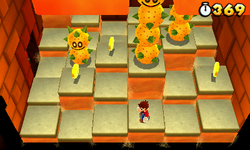 Reaching the top, the player finds the Star Medal, as a Spiked Ball rolls from the place. This page was last edited on April 15, 2019, at 15:34.